i Click 'view all' to instantly compare this good deal with offers on other top duvet covers king. Kotton Culture 3pc Egyptian Cotton Pintuck King Duvet Cover Set, White is currently selling at $104.00, approximately $0.07 lower than average, giving a potential saving of $43.70 right now. With a lowest price of $104.00 and an average of $104.07 it is selling on the low end of its usual range. Price volatility is 0.59% (meaning it does not change often), so the price should stay low for a while. Right now this product is a recommended 'good deal'. There is a coupon available for an additional 5% off. The current deal is also the best price on this item over the last month. 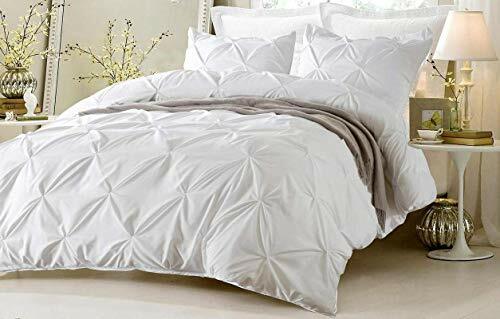 Compare the current price, savings (in dollars & percent) and Buy Ratings for the top Duvet Covers King that are closely related to Kotton Culture 3pc Egyptian Cotton Pintuck King Duvet Cover Set, White. Here is how Kotton Culture 3pc Egyptian Cotton Pintuck King Duvet Cover Set, White compares with other leading Duvet Covers King. Discover luxury with this fine Duvet Cover made of 100% Egyptian cotton. Widely known for high standards of durability, strength, and softness; the smooth finish of this exquisite product will make you feel like true royalty. This unique Product is a symbol of grace and what makes it stand out is not just the magnificence it can instantly add to your bedroom.Its packaging is done using recyclable material making it an environmentally friendly product. Made from one of the finest grade fibers in the world, this effortlessly stylish Duvet Cover is an example of outstanding Egyptian finish making it the object of fancy for everyone looking for an upscale living.Enjoy an experience of a true luxury and a cool comfortable night's sleep with exceptionally Soft breathable Duvet Cover set that have a ultra-soft feel. This Duvet Cover set to provide a lasting vibrancy of color no matter how often they are washed and are made of high-strength Egyptian cotton that will stay soft for years. FeaturesLUXURIOUS PINCH PLEATED DESIGN - 600 Thread Count, Luxurious pleated design features pinch Style pleating technique. This gorgeous pinch pleat looks very elegant. 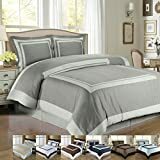 It is a simple and sophisticated way to enhance any bedroom's look.DUVET COVER WITH ZIPPER CLOSURE AND CORNER TIES - 1 California King / King Sized Duvet Cover (102"X94") And 2 Pillowshams (20"X40"). 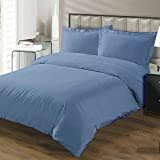 Features A Hidden Hassle-Free Zipper Closure, Easy To Get Your Comforter In And Out Of This Cover.HYPOALLERGENIC 100% EGYPTIAN COTTON DUVET COVERS - 100% Egyptian Cotton, A Fabric Known for Its Luxurious Appeal And High Durability. Our Duvet Covers Are Specially Designed Using A Tighter Fabric Weave To Be Allergen-Resistant, Particularly To Dust Mites, Which Makes It Perfect For People Who Are Prone To Allergies Or Asthma!COMFORTABLE & DURABLE - Ultra soft and smooth. Duvet Cover is Finished With High Strength Stitching to Match That of The Cloth.